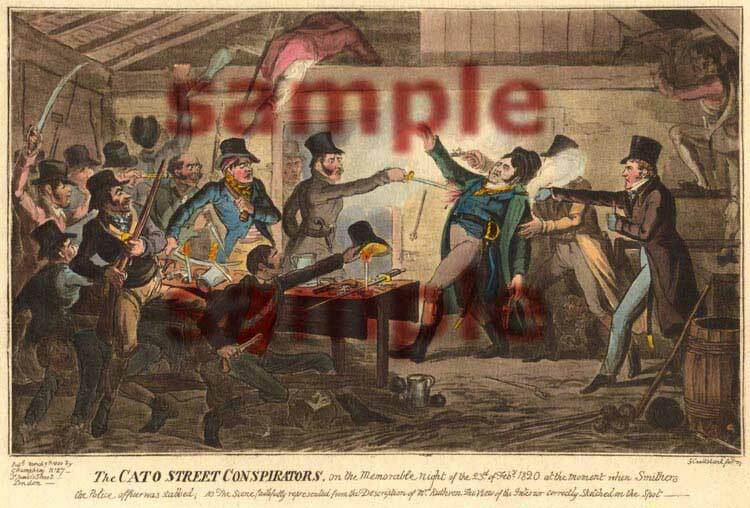 “ The Cato Street Conspirators, on the memorable night of the 23rd of February 1820, at the moment when Smithers the Police officer was stabbed; NB the Scene faithfully represented from the Description of Mr. Ruthven, the View of the Interior correctly sketched on the Spot ” The Cato Street conspiracy was a plan to overthrow the British government. This painting depicts the affray between police officers and approximately 20 conspirators who were meeting at a hayloft on top of a house on Cato Street. Shown in this painting is the violence and ferocity of such a brawl. The fatal stabbing of police officer Smithers by a man wielding a small sword is the most prominent fixture of this painting. Among the various types of weapons that can be seen in this painting are muskets, pistols, sabres and a hand held bayonet.